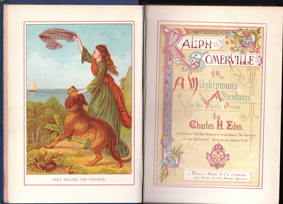 Publisher: Marcus Ward & Co. Description: Contains a stunning, full-colour frontispiece (unattributed) and 4 beautiful, full-page engravings. Illustrated throughout with further superb b&w drawings and text decorations. 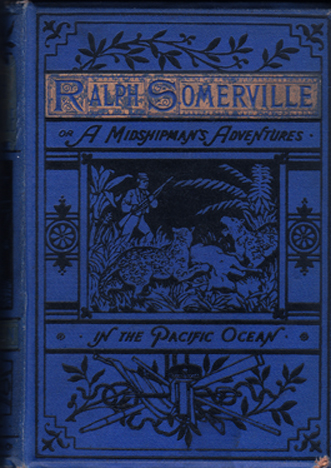 Ultramarine boards with embossed titles and illustrations on front and spine. Gilding has faded from the latter. Spine bumped; corners lightly so. Slight damage in lower-right corner of front board (refer to image). Pastedowns and endpapers lightly tanned and foxed. Incredibly for a 135 year old book, all pages have resisted tanning and are very bright. Foxing is also very sporadic on the occasions when it is encountered. Pages tightly bound – in some places extremely so. A very good copy of the ultra-rare first edition. Measures 19 cm × 13 cm (7.6″ × 5.2″) Large 12mo. 316 pp.